I've often said that one day when (not if, WHEN) I win the Powerball that I'm having a salad bar installed in my house. Having won the Powerball, I'll also be able to employ a full time salad bar attendant to keep it all nice and fresh & pretty. But in the meantime, I have to either seek out a good salad at a restaurant or make one myself. As we all know, anything homemade is better every time. But, salads can be like sandwiches...they always seem to taste a bit better when somebody else makes it for you. Today was a salad day, but I had no one around to make one for me and alas, I still haven't gotten my salad bar and attendant. So, I whipped up what I'd say turned out to be a beautiful and delicious, super-fresh veggie delight. And crazy simple. I tore some romaine, sprinkled a little cheddar, a few croutons, sliced some olives, my homegrown cucumber, my dad's homegrown tomato and my homemade bleu cheese dressing. Usually, I'm not a big cucumber fan. But, I have noticed a homegrown cuke always tastes better than a grocery store one. I slice them thinly and sprinkle with salt and boom, I'm a cucumber eater. My dad's tomato was perfectly sweet and a beautiful blood red. Again, a little bit of salt and some pepper and it was divine. Cheddar I don't know how to make, but I assure you, if I did, I'd make it myself. Same thing with olives. Trust me; if we could grow olives in South Carolina, my backyard would be a veritable grove. Now, salad dressing, I've told you about before. With a couple of exceptions, I don't buy dressing. It's just too damn easy to make yourself and (you know what I'm going to say...) it's so much better when you make it yourself. I love this guy's recipe, but I do thin mine with milk. This recipe makes a super thick and chunky dressing. It you want/need it to be more liquidy, the milk does the trick. 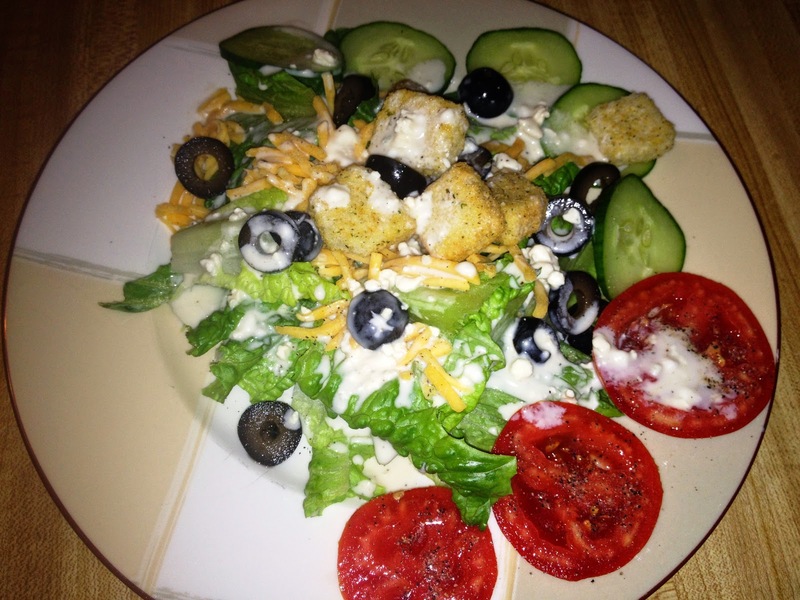 If you're a bleu cheese lover, try this dressing. Like, now. We're lucky here in the South because we can grow practically everything (ok, except olives, artichokes, oranges, but pretty much everything else). And we still have a couple months in our growing season so take advantage of all that our markets and your own gardens have to offer! The Black Bean Co. from Charleston has joined the Capital City ranks. Before I even knew they were coming here, or were already here for that matter, I noticed their Folly Road location as we were headed for Folly Beach a few weeks ago. And lo and behold, they are here and I got to check them out yesterday with my mom and dad. If you haven't ever been to a Black Bean Co. or checked out their website, their concept (as I saw on the back of aT-shirt) is "Diet Food is Out, Energy Food is in." The menu consists of breakfast and lunch offerings, mainly in the form of wraps and salads featuring local and/or organic and natural foods. You choose your protein to add to their creative and vast assortment of choices. And, that's what really hit me today. There are times that when lunch rolls around I just think about having some kind of a good sandwich. But if you really think about it, there aren't many places anymore that offer any sandwiches of any interest. It's all the same: turkey with some bacon, buffalo chicken, the same-ol-same-ol chicken salad, turkey with blah, blah, blah. You won't have that problem at the Black Bean Co. I ordered one of the "Pure Energy Wraps" entitled the Black and Blue. It is a gigantic wrap of white meat chicken, blue cheese, avocado, mixed greens, black beans, rice and the best condiment: fig balsamic vinaigrette. All of the components were wonderful but that vinaigrette is fantastic and just ties it all together. I do wish the avocado were a bit more plentiful however. The Fig Balsamic Vinaigrette rock this wrap! My mom ordered the Thanksgiving Joy. As many of you know from this post, my mom is the Thanksgiving turkey & dressing-a-holic to end all holics. This one is packed full of turkey, cranberry, sprouts, mixed greens and fresh mozz. Dad opted for the Beach Burrito. This wrap consists of chicken, mango salsa, mixed greens, black beans, rice, sprouts and guacamole. Both mom and dad liked their choices very much. However, once my dad got a couple bites into the 2nd half of his wrap, the ingredients dwindled down to nothing but salsa, greens and rice. Lots and lots of rice. Mom and I encouraged him to take it to the counter and let the staff know, but my dad isn't a wave maker. We all ordered our sandwiches as a combo (wrap, side, drink) because we learned from the lady taking our order that it is more economically sensible to order it that way, as a sandwich and drink are only a few cents less. So, it's like getting a free side. This makes me wonder why not just feature all the wraps with a side and drink for one price? Potato salad is kind of like pizza...there are 5.17M+ ways to make it. The salad at Black Bean is a pretty classic preparation with hard boiled egg, chopped red onion and chopped celery. I really thought my mom would reject it because she's not a raw onion fan at all. But, she ate all of hers without complaint, so that says something. I loved the flavor, but I'm not a hard boiled egg fan which means I'm constantly teasing through mine looking for the egg slivers. Plus, you guys know how I feel about celery, right? I forced myself to just plow through the celery, but I truly think celery is the vegetable from hell. Somehow someone managed to convince the rest of the population that EVERYBODY just loves that foul stalk of ickiness. Not so much. So, here's the deal. I really like this place. The choices (choose your protein) and all the fresh veggies are more than abundant. The combinations they've come up with make for a vastly interesting array of sandwich and salad choices. And, they have a kids menu that makes me smile. One thing I'd offer to the management, if they wanted my opinion, is to offer the wrap in a half size. They are enormous. I couldn't even think about eating my whole wrap. You know the only problem about having a Chef'Store in your town? It's when you go with someone who convinces you that for only $17 and some change the two of you can surely figure out how to use 50 lbs of potatoes. Seriously. Mom and I had an open house coming up and we were doing a baked potato bar. We might have needed 4 potatoes, maybe 12. One never knows. But you can't buy potatoes that way at the Chef'Store. Nope, it's like being at Sam's. Fifty pounds. At first, my mind, like any other sane person's, said "50 lbs? Are you crazy? Of course not!" But then I started doing the math. Oh, curse you trusty calculator! Turns out $17 and some change for 50 lbs of potatoes is a damn good deal. As we unloaded that giant box from the car later, I began having some of that We-just-over-bought-out-the-ying-yang anxiety. What in the world was I going to do with all these pommes de terre? Well, first off, I baked a lot of them for the open house. Unfortunately not many people showed up, so I brought many of them home. No worry...potato soup for dinner. But there was that huge cardboard box sitting on the table just staring at me. I thought. I contemplated. I consulted cookbooks. Finally I had a plan. The freezer was going to be getting lots of new temporary friends. 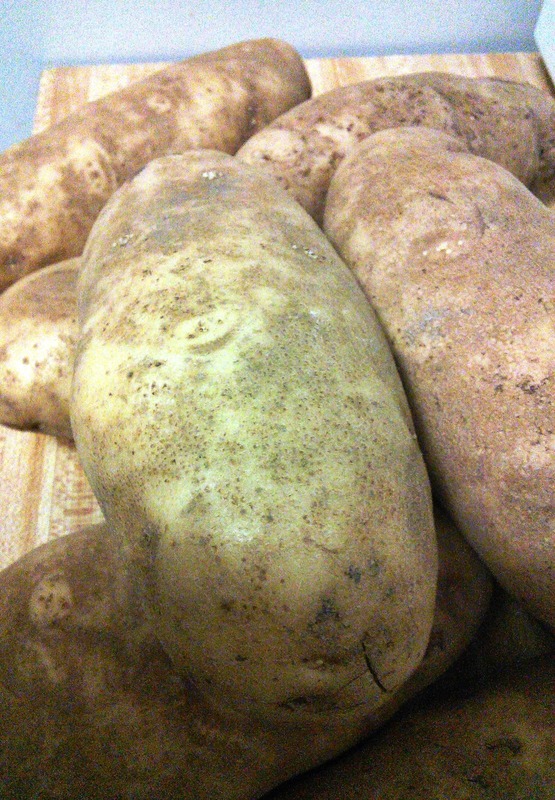 I spent one long morning dispensing with these spectacular spuds. 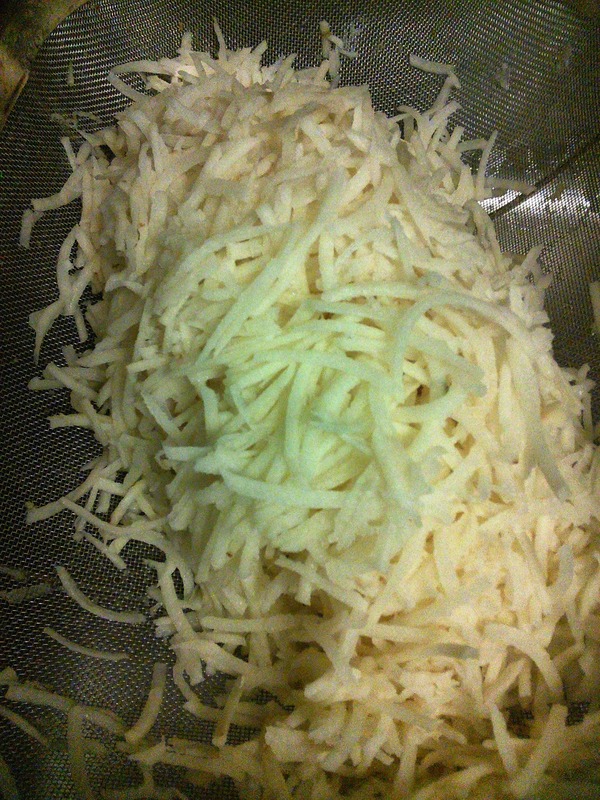 I grated, rinsed, blanched and rinsed again about 20 cups of hash browns then bagged them all up in freezer bags. 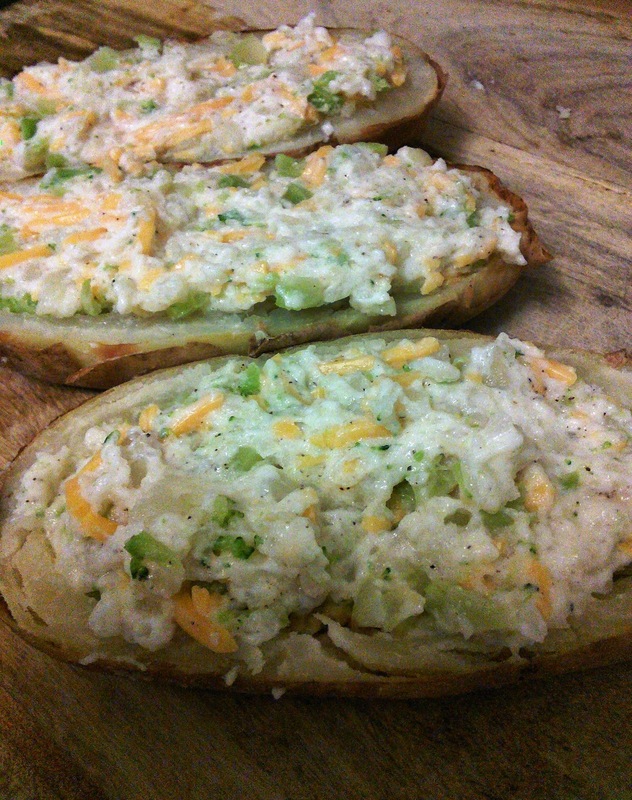 The rest I baked then created 3 types of "twice-baked" potatoes: sour cream & chive, broccoli & cheddar and cheddar & ham. I wrapped each in plastic wrap so they could be taken out of the freezer as individual portions then bagged and labeled. Just like the Waffle House! Since I put all of this in the freezer, we tried the hash browns first. Simply put, they worked perfectly! All of the rinsing & blanching has caused them to keep their color (or lack thereof) and they cook up nice and light and crispy. Last night we had Alaskan snow crab legs with our sour cream & chive potatoes for dinner. The potatoes are packed with flavor and the edges of the skins got browned and toasty. It was a good combo with the sweet crab and butter. You probably know this about me by now, but I'll say it again. I just sleep better at night knowing that I have good things waiting in our freezer. It's so comforting knowing that on a busy school night, or after a hard day, or on a day when I still haven't gotten around to going to the grocery store, we have dinner available in the big cold box. Over recent years, I've also made a goal to become as resourceful as possible. Once upon a time, I'd have thrown out all of the potatoes I just didn't get cooked before they went bad. Today's me would have a heart attack instead! This is why all our stale bread becomes bread crumbs stored in the freezer, old shrimp and crab shells stay frozen until we need to make stock, and and leftover chicken tips from Zorba's get turned into chicken salad! Things in the this world to love: family, travel, food, wine. Over the last couple days, I got to have them all. My sister was in Asheville for some biz meetings and invited me and the little foodie to come share the hotel room. We have had an action-packed couple of days including Sliding Rock, Biltmore House, Looking Glass Falls, Grove Park Inn and chillin' in downtown Asheville. Since K was involved in meetings all day, Viv and I had all the time in the world to do whatever we wanted, including seeking out good, eclectic A-ville food. 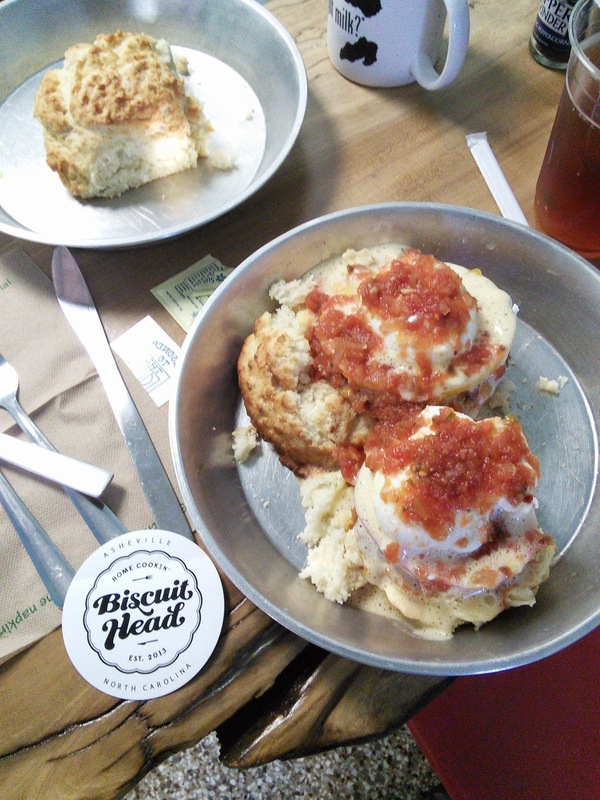 At my sister's recommendation we followed our noses and our GPS to Biscuit Head. We went to the newer location on Biltmore Avenue. It's a small, cute space with a really friendly and close-knit atmosphere. You order at the counter, fix your drinks, make your selections at the (extensive) jam, jelly, butter and honey bar and then the staff delivers your food to the table. At first, Viv wanted to sit at one of two cool terrarium tables that were fashioned out of old windows over table tops to create living terrariums. Very cool touch. But, she changed her mind and chose a small table for two that appeared to be made of one slab of hand-hewn wood. Viv has a tendancy to be a purist. She asked for some milk and then blew my mind with this line: "I was noticing that "got milk" mug hanging in your window." So, the lady says, "would you like to use it?" and there you go. Probably got her twice the milk of a regular order. She wanted just a plain biscuit with honey, so learning about their honey bar was quite a plus. She tried clover, wildflower and sriracha honey. The wildflower won out as the favorite. I chose the fried green tomato biscuit. In a word(s)? Holy mother of all that's put on a biscuit with smoky, creamy, brie-y, what-what???? First of all, it's humongous. Way bigger than your average bear can consume alone. So, unless you're a lumberjack sort, I'd recommend splitting this with a friend. It's a cat-head biscuit (of course) split and each half topped with a fried green tomato, a slab of fresh tomato, brie, a poached egg and smoked tomato hollandaise. The only hiccup at all was the the poached egg was a bit over cooked, but if you've ever tried to make poached eggs, you know this can happen in an instant and until chickens start laying transparent eggs, you just don't know. The tomatoes were fresh and wonderfully flavorful but man! that smoked tomato hollandaise was a creamy nectar of the gods. So perfectly smoky that it lingers with you, in a good way. Add all these strong flavors with the creaminess of brie and you're in a culinary tongue twister. Now, we Southerners can consume iced tea in volumes to rival all the tea drinkers in China. Unfortunately, that volume leads to some weak, mediocre tea that in some cases ends up just being overly sweet brown water. I ordered tea at Biscuit Head and it was RIGHT. Good flavored tea, brewed properly, sweetened to my specs and was an awesome glass of iced tea. Any more, I think it's of note when a restaurant is actually brewing a good batch of tea because too many aren't. Take a look at the menu. These are some really innovative preparations that elevate the biscuit to new heights. 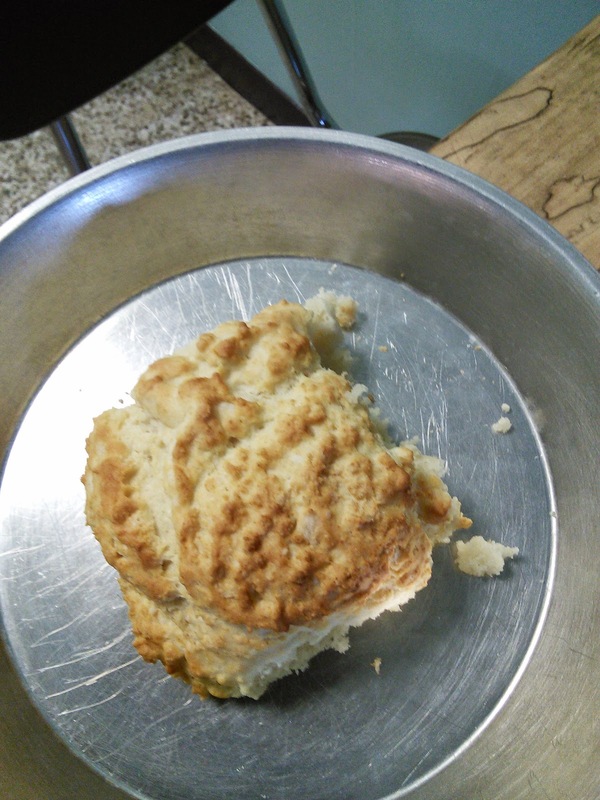 Those of us in the South have always known the pristine beauty of a perfect biscuit, but now with these creative variations, even a Yankee tourist can get in on the game and realize the true culinary aristocratic nature of a proper biscuit! The original Biscuit Head is located at 733 Haywood Rd and the newer one is at 417 Biltmore Ave. Click the link to their site and check out the menu. Oh, by the way, the coffee rocks as well!